OSWEGO — A grant from the National Institutes of Health will help SUNY Oswego chemistry faculty member Dr. Kestutis Bendinskas advance understanding of how low levels of lead affect children’s cardiovascular health. 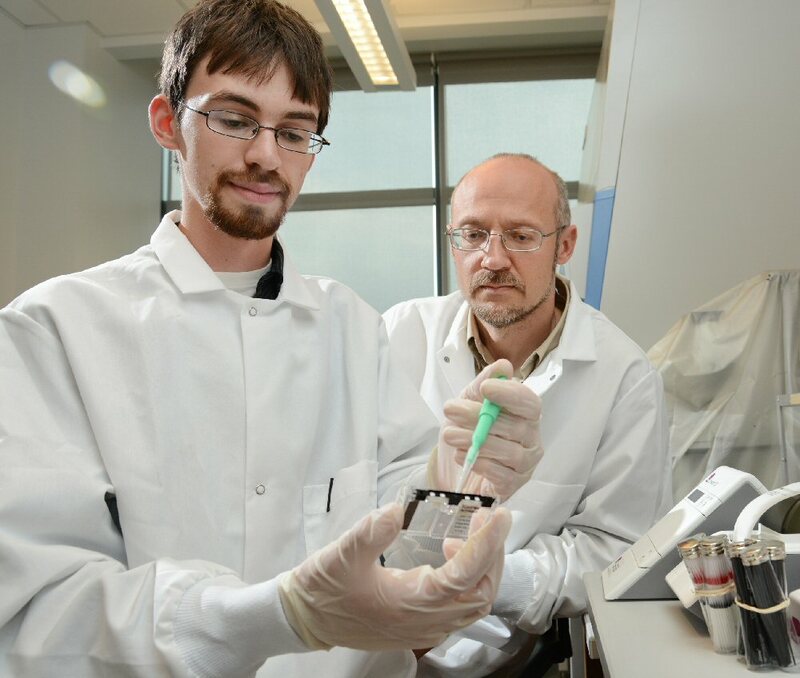 SUNY Oswego junior biochemistry major Ethan Walker prepares to load a slide with a blood sample as Dr. Kestas Bendinskas of the chemistry faculty observes. Bendinskas recently received NIH grant funds to do broader analysis of low levels of environmental lead in children’s blood streams, which can lead to cardiovascular damage. Thanks to $99,000 from NIH’s Environmental Health Sciences institute and collaboration with top experts in metabolomics at the University of Michigan, Bendinskas is working to develop skills and research to identify how environmental lead in very small amounts — from lead paint chips, piping, gasoline and other manmade sources — damages the circulatory systems of children. The NIH supplemental grant spins off a $1.8 million study led by Syracuse University’s Dr. Brooks Gump, a professor of public health who formerly was in SUNY Oswego’s psychology department. Gump and his team are investigating racial and socioeconomic disparities in 300 children at high risk of exposure to environmental toxicants in three Syracuse ZIP codes, in cooperation with researchers from SUNY Oswego, SUNY Upstate Medical University, St. John’s University and other institutions. In the current grant, Bendinskas, SUNY Oswego colleague Dr. James MacKenzie of the biological sciences department and three undergraduate students have sorted, preliminarily tested and stored samples from about 100 children in Gump’s Syracuse study group. The samples will be shipped and further tested and analyzed using advanced instruments available at Michigan’s Comprehensive Metabolomics Resource Core, led by Bendinskas’ mentor for metabolomics, Dr. Charles Burant, the University of Michigan’s Robert C. and Veronica Atkins Professor of Metabolism. “The current grant is a perfect fit for our institution, because we consistently promote undergraduate research,” Bendinskas said. Oswego undergraduates assisting with the study include Ethan Walker, Hannah Valentino and Sasha Padilla. Walker, a junior biochemistry major, has been working with the Syracuse samples for a year at SUNY Oswego’s Mammalian Culture Room in the Shineman Center. The grant comes through the NIH Common Fund, which strategically supports the expansion of expertise in metabolomics — the systematic study of hundreds of substances the body needs or produces to sustain life — by promoting data sharing, collaborative training and mentoring, and development of next-generation technologies for testing and analysis. Michigan’s Burant expressed enthusiasm for the project. “I am impressed with the way in which the team has systematically collected the samples, which should provide high quality samples that will have a very high likelihood of providing new insights into the biological actions of lead in this vulnerable population,” he said. Bendinskas said the inspiration for incorporating metabolomics research in the larger study of the effects of low levels of lead in children came from conversations with Dr. Gilbert S. Omenn, director of Michigan’s Center for Computational Medicine and Bioinformatics, following a presentation Bendinskas made on the research at the 2013 congress of the Federation of European Biochemical Societies in St. Petersburg, Russia. Omenn has pledged the assistance of experts and bioinformatics tools in the analysis of lab research on the Syracuse samples. “If and when we understand the mechanism, then hopefully we can affect the mechanism in such a way that it negates lead’s effects on the cardiovascular outcome,” Bendinskas said.